In 2018, the Mercedes A-Class will become larger and sharper as it ups its game in the fight against the BMW 1 Series. The next-generation model will use a longer wheelbase and feature a roofline that extends further back into a more vertically-angled tailgate than today’s model. Both cabin space and boot capacity will grow as a result, making the future model more practical. Tweaked looks will give the car a more aggressive demeanour. Sources say the larger interior will also feature plusher materials and Mercedes’ latest infotainment system, with top-spec models likely getting a widescreen display. The fit and finish of the cabin will also be improved, with strong competition from Audi and its Virtual Cockpit dash layout – which will soon be offered in smaller models – setting the bar very high in the compact sector. The new A-Class will gain an updated range of turbocharged four-cylinder petrol and diesel engines, and there’s also a chance hybrid technology will be integrated into the range later on. This would come as part of Mercedes’s push for a larger electric range, which currently only features EV versions of its B-Class and Smart models, but will soon gain an SUV, as seen testing earlier this year. At the other end of the line-up, the range-topping AMG A45 version of the new A-Class is expected to produce close to 400bhp. Today’s version of the four-wheel drive hot hatch gets 376bhp from its turbocharged 2.0-litre engine. Its next-generation rivals, including the 2017 Audi RS3, all look set to beat that figure. Dodge Viper: 25 years on, does it live up to its venomous reputation? “Pull for emergency exit,” says the oversized catch on the door. It’s winter, there’s patchy black ice on the West Sussex lanes we’re driving along and said catch is attached to a Dodge Viper GTS – not exactly a paragon of clinical precision. It is my fervent hope that I don’t have to use the catch, but it’s not a bad idea to keep its location in mind. The Viper has always been a hero car for me. Forgive the straight lift from the motoring hack’s book of cliché, but I really did have a poster of one on my bedroom wall when I was a whippersnapper. That poster was most likely of the earlier and original RT/10 model, which was launched in 1992. That makes the Viper 25 years old this year, and that seems like the perfect excuse to revisit this glowering hunk of American excess. 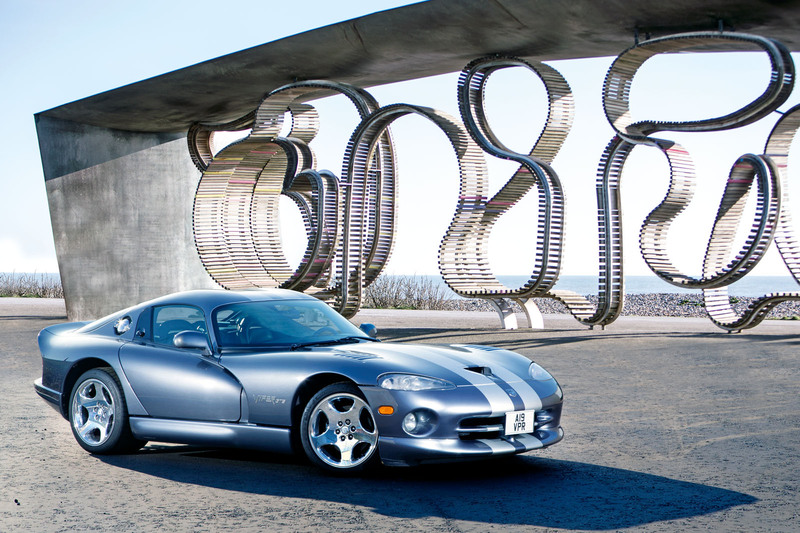 Those first Vipers were production versions of a concept car first unveiled in 1989 at the Detroit show. It took three years for engineers to bring the concept to life. 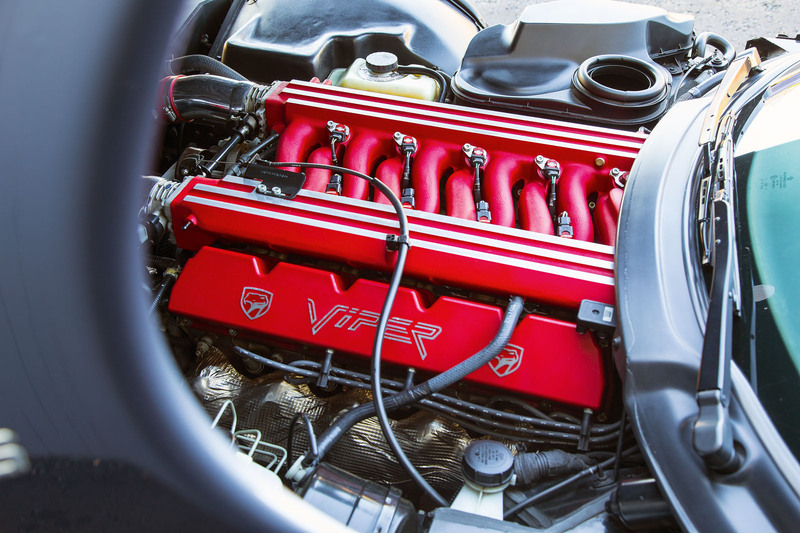 The original plan was for the Viper to use an evolution of the LA360 V8 with, in effect, two extra cylinders grafted on. The engine was also destined for use in Dodge’s Ram line of trucks. But a series of refinements by Lamborghini, then part-owned by Dodge’s parent company Chrysler, resulted in the engine projects growing apart, with the biggest change of all being the switch from a cast iron block to an aluminium one for the Viper. Remember this the next time someone tells you the Viper had a truck engine: it’s not quite true. The myth is believable, though, largely because the Viper was something of a ‘bitsa’. Indeed, it’s often forgotten that low cost was one of Chrysler’s stated aims with the project, so the production engineers scavenged parts from wherever they could around the Chrysler organisation. It showed in that first RT/10, despite their best efforts. “Even with all those cylinders, the engine wasn’t as smooth as you’d think,” says Autocar’s Steve Cropley, recalling the first time he drove the RT/10. That development came in 1995, with the advent of the second generation car and, most notably, the new GTS coupé – a late example of which we’re driving today. Power was up to 450bhp and while it might look similar, in fact 90% of the GTS’s parts were either upgraded or switched out completely. It shows. A strong shove is still needed to get the gearstick into first, and the combination of a long-travel clutch pedal and hairtrigger accelerator requires careful moderation of each foot when pulling away, but there’s none of the heft you might expect from the steering. Once rolling, the Viper is remarkably benign, with a smooth and progressive throttle and even a reasonably comfortable ride. But what you really want to know is how well it goes. 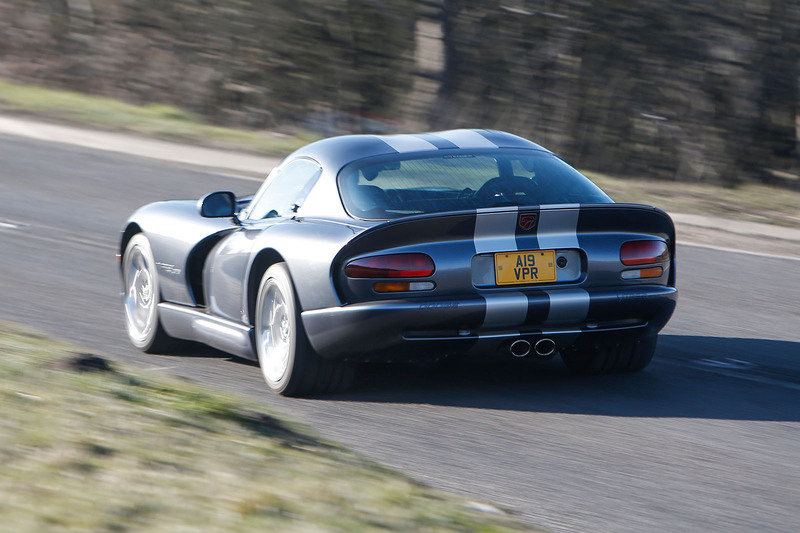 Well, even on these cold roads, the Viper isn’t uncontrollable. Lairy, for sure, and a moment’s inadvertent exuberance with the throttle will light up the rear tyres. But there’s a monumental amount of front-end grip, so the car snicks into corners surprisingly well, and a squeeze of the throttle on the way out hunkers the back end down at first, rather than simply sending it sideways straight away. But be under no illusion: this is a car that’s happier on the straights than it is in the corners. Simply placing it is the first problem: that long, wide nose obscures half of the road ahead, and then there’s the slow steering and the wooden brakes. No, far better to amble through the twisty bits at a moderate pace and then point ‘n’ squirt to your heart’s content once there’s a clear, flat bit of asphalt ahead. And squirt it most certainly does. When you pin the throttle, it feels as though you’ve just been pushed off a cliff. An initial shove in the back is followed by an ever-more urgent gathering of momentum until, knuckles white, you find yourself hoping that whatever comes next is as quick and painless as possible. But instead of oblivion, you find yourself at the redline. So you manhandle the gearlever through the gate and go again, revelling in an engine note more guttural than that of a contemporary V10 from Italy or Germany; one that’s halfway in tone between such engines and the American V8 you sense this one has been tuned to mimic. The volume hits you, too. Even off the throttle, it chunters and growls, attracting the wrong kind of attention even when you’re trying to remain as inconspicuous as possible. This is a fantastic good-time car, then, and brilliant fun to drive. But to own? Hmm. The problem comes when you spend enough time with it for the novelty to wear off. It’s then that you notice you’re cramped up against the door, looking at an acre of shiny, brittle plastic and trying to ignore the squeaks and rattles and the health and safety notices that remind you that objects in the mirrors are closer than they appear. For some, this car’s unapologetic drama and in-your-face attitude has no equal. With production of the current-generation Viper set to come to an end later this year, it seems unlikely that it ever will. If the prospect of Viper ownership appeals, the price to join the club is £49,995 in the case of this GTS, a 2000 example with just 26,000 miles on the clock, although earlier cars with higher mileages can be found for much less. Think of the Viper as a bona fide supercar and that might not sound too bad. Trouble is, the Viper isn’t really a supercar. It’s a modern-day hot rod; a car unto itself, which doesn’t really bear comparison with anything. Whether a used example is worth the money is therefore an entirely subjective question. I’ll stick with the poster on my bedroom wall, but when you pass me in your Viper, that V10 engine note ripping the air in two as you squirm up the road, I’ll feel a pang of envy. The great thing about the Viper is that its simple engineering means very little goes wrong. Tyres are expensive, so check treads, and make sure the clutch isn’t slipping – on a low-mile car, it’s a sign of abuse. Servicing is far cheaper than on most cars with this sort of pace, and because the engine is so big, it’s unstressed, so bits rarely fall off. C check the fibreglass body for damage, and the interior plastics for cracks. The new zero-emissions Electric GT series aims to follow the lead of Formula E by injecting excitement into the image of electric vehicles. The series, which will begin in the autumn, will initially be contested by track-prepared versions of the Tesla Model S P100DL. Formula E has showcased electric single-seaters, whereas EGT is based around cars that resemble road-going EVs. At the moment, of course, there aren’t many performance-orientated pure EVs on the market, hence EGT’s initial focus on Tesla. However, the series is open to all and the hope is that more varied grids will be seen in the future. The racing Tesla has beefed-up bodywork, with flared wheel arches and a large rear wing. The car sits on racing suspension and 18in wheels shod with Pirelli racing rubber. The interior has been fully stripped out and an FIA-standard rollcage has been fitted. At first glance, you might mistake it for a petrol-drinking GT racing car, apart from the fact that it makes hardly any noise. 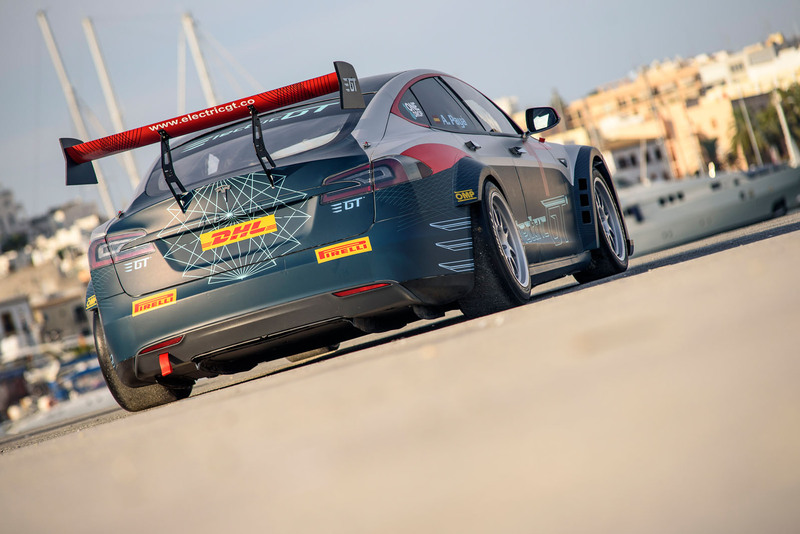 “The changes we’ve made to the car are quite straightforward because we’ve used the P100D road car’s standard battery and motors,” says championship boss Mark Gemmell. The racing car has bodywork made from carbonfibre and although an official weight figure hasn’t been revealed, it is estimated to weight around 1600kg. It’ll also be much quicker: tweaks to the rest of the electric propulsion system mean the P100DL makes 778bhp and 734lb ft and can cover 0-62mph in 2.1sec. That acceleration is not only 0.3sec better than the road car, but also neck and neck with a modern Formula 1 car. A Formula E car requires a further 0.9sec to hit 62mph from a standing start. 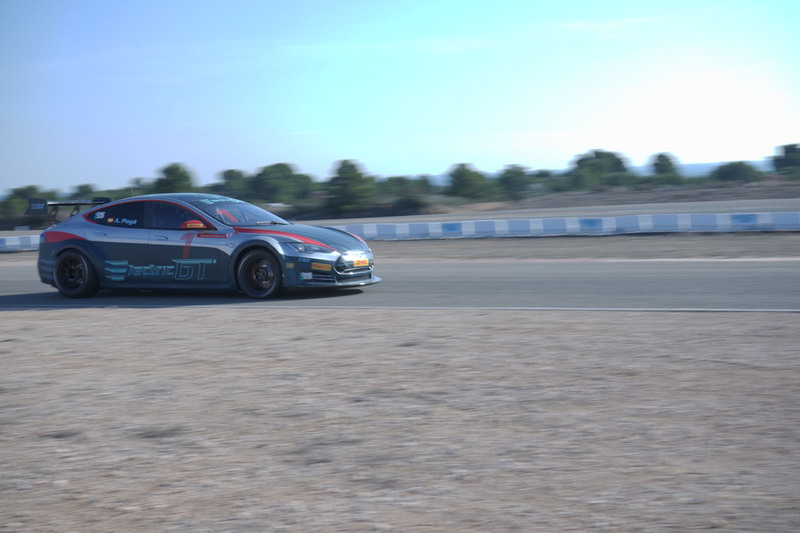 EGT races will have standing starts in order to showcase the impressive acceleration. The car can hit a top speed of 155mph. Silverstone will host the opening round on 12 August. 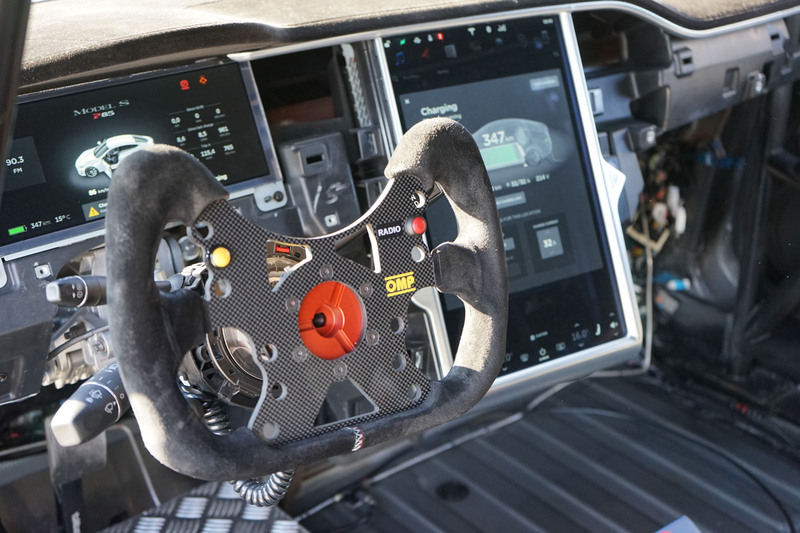 The following races will take the Electric GT circus to Assen in the Netherlands and then the Nürburgring to race on the German track’s DTM configuration. After this, Portugal’s Algarve International Circuit, Misano in Italy and Barcelona’s Circuit de Catalunya will host a race each, before Paul Ricard in France closes the 2017 season on 25 November. Maintaining interest is something EGT intends to do by pulling fans close to the action. Spectators will be able to stream live video feeds from each car’s cabin during races. They will also be able to engage with the drivers via what Gemmell calls “a non-distracting heat map of support”. Put simply, a fan watching a race at home will be able to use social media to ‘like’ a particular driver who has impressed them. This support will be displayed for the driver on the Tesla’s infotainment screen, with the intention that it will encourage the driver much in the same way that a cheering crowd can spur on a football team. The interaction between drivers and fans will be two-way, according to Gemmell: “By removing the engine noise, the driver can also interact more with spectators. In normal motorsport, where the car is loud, the driver in their helmet can seem like a bit of a robot. Gemmell compares the experience with watching a tennis match, where a player’s effort can be heard as they strike the ball. “It gives you a tremendous degree of empathy with them,” he says. EGT races will be fairly short, with the chequered flag falling after the leading car has covered 37 miles, which will equate to about 17 laps at Silverstone. There’ll be two races: one in the day and the other at dusk. The first race will be contested by 20 identical cars divided into two-car teams. Although Gemmell won’t reveal the identity of any drivers who will be competing in the opening season, he says they will be “fantastic, quality professionals”. 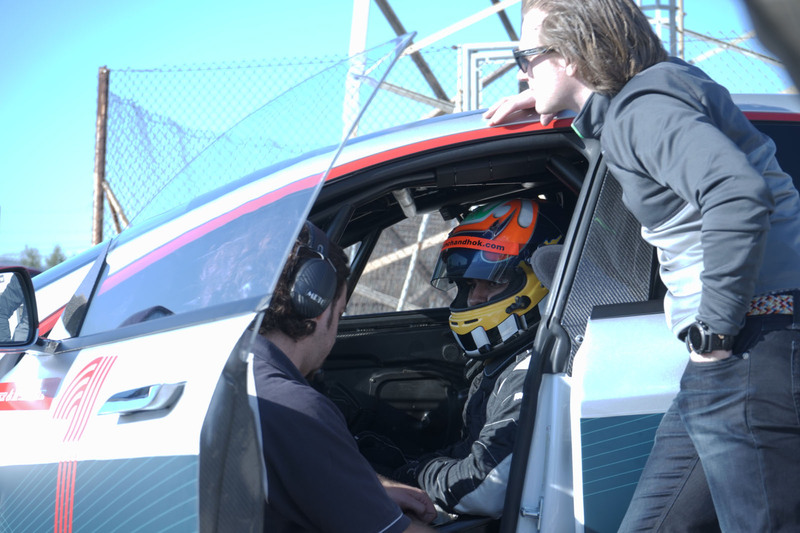 Prior to the start of the series, EGT has established a drivers’ club that has attracted support from seasoned competitors such as British Touring Car Championship driver Tom Onslow-Cole, sports car racer Oliver Webb and former Formula 1 test driver Dani Clos. “We’re also trying to get top quality women drivers involved, because that attracts another huge section of the public to the events,” says Gemmell. “We want to involve women in every role: as drivers, in teams and as marshals.” When the lights go green at Silverstone in August, he thinks zero-emissions motor sport will take a significant stride into the future. By the time the 20th century was becoming the 21st, Nissan’s Japanese bosses had become used to the sensation of desperation. The company had travelled to the brink of existence by 1999 and bankruptcy had been fended off only by an audacious manoeuvre led by Renault’s Carlos Ghosn. The French manufacturer acquired a 37% controlling stake in Nissan for a life-saving $5.4 billion (£4.33bn). What happened next is automotive legend. Ghosn’s foundation-shaking Nissan Revival Plan turned the company around by doing the culturally unthinkable in Japan: shutting factories, breaking up cosy and costly ‘keiretsu’ crossshareholding arrangements with suppliers, making redundancies and more. But it worked. In amazingly short order, Nissan returned to profit and started to produce desirable cars again, under the guidance of talented designer Shiro Nakamura. But not in every quarter. Several less than scintillating cars were too close to the end of the development pipe to be scrapped or significantly altered. One of these was the second-generation Almera small family hatchback. It was certainly an earnest improvement on the curiously barrel-bodied first-generation model, the interior of which was as inviting as a smashed bus shelter on a winter’s day. The new version threw off the eaten-too-many-pies look, sported tail-lights as big as salad bowls and came with excitements such as shopping bag hooks, a loadsecuring net and more in-cabin nooks and crannies than a Cheddar Gorge cave. It was also pretty tidy in the chassis department and had no serious flaws other than a rear leg room shortfall. However, the big problem was that it didn’t have the brand and showroom appeal of the Volkswagen Golf and Ford Focus. Once again, Nissan was left wondering how it would ever enjoy the heady success it had seen in the UK during the 1970s, when the Cherry and Sunny regularly appeared among Britain’s top 10 best-sellers. Nissan’s Focus-chasing sales goals were receding like the unreachable refuge of a chase nightmare. But despite that, the company was masochistically lining itself up for a third pop at an Almera bullseye. During 2002, its designers and engineers were hard at it, as product planning chief Pierre Loing recounted a couple of years later. But Ghosn, by now steering a robustly recovering Nissan, cancelled the programme in December. “Merry Christmas!” was Loing’s understandably bittersweet reaction to this news. Despite binning a heap of work, Loing knew that Ghosn was right. The next problem was how to conceive a car decisively more appealing than a shopping hookkitted Almera. The Ghosn way is not to stare at a blue sky waiting for a vision but to get down and understand what customers might want, using plenty of research and analysis. What that turned up was that the C-segment in which the Focus, Golf and Almera were competing was already fragmenting towards MPVs and four-wheeldrives. Further delving uncovered signs that punters didn’t necessarily need the absolute versatility of an MPV, and that while they liked the chunkily adventurous, high-riding demeanour of a four-wheel-drive, they didn’t want the bulk and complication of the breed. So perhaps there was something in between. From today’s perspective, it seems a fairly modest leap to deduce this, but in the early 2000s, it was only a research-backed hunch. “The Qashqai has a distinctive flavour born out of the theoretical buyer’s emotional and functional needs,” explained product planner Etienne Henry in 2005. And at that point, two years before project P32L was ready to go on sale, the Qashqai buyer really was only theoretical. 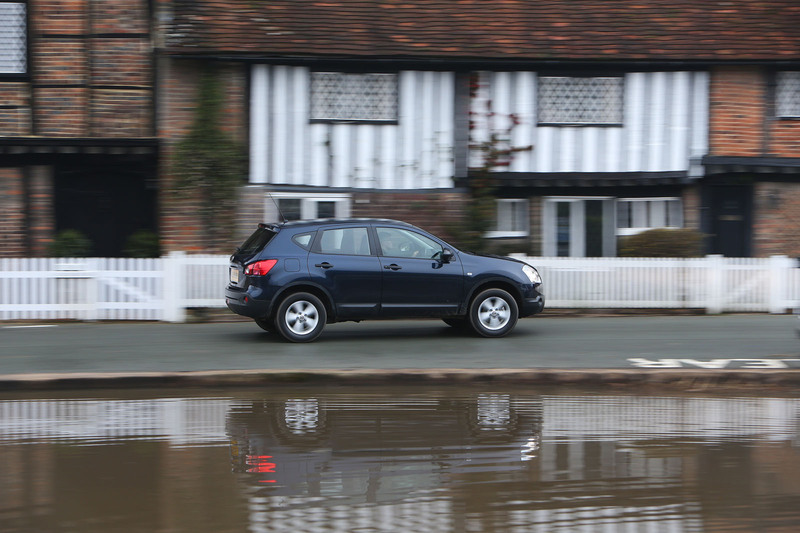 “Back in 2007, the introduction of the Qashqai was a risk,” says Nissan’s vice president for Europe, Paul Willcox. “It was defining a new segment that didn’t exist and therefore we were uncertain as to what the reception would be. But it’s been unbelievable, from launch right the way through to today. We have won many press awards, the industry has followed our lead and every competitor has brought a crossover into the segment. It may be a Nissan chief telling it, but the numbers say he is not wrong. Since the model’s launch in February 2007, Nissan has sold more than 3.3 million Qashqais of both generations in 137 countries. Of those, 2.3m were bought in Europe, its primary market, and 261,429 in the last year alone. For many, the Qashqai makes a stage in people’s motoring life more palatable than it would have been in the days when frumpy MPVs and rattling estates were the only choices. Some of this writer’s neighbours are a case in point: before kids, a BMW 320d Coupé occupied the drive; after kids, it’s a Qashqai. 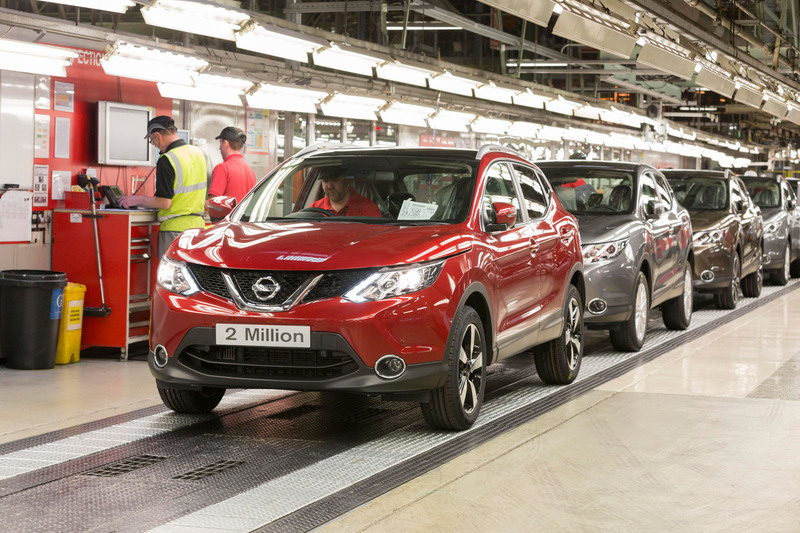 Nissan’s Sunderland plant has played a huge role in the Qashqai’s success, this factory being the primary supplier. By the end of 2016, it had produced 2,655,551 of the 3.3m global total. 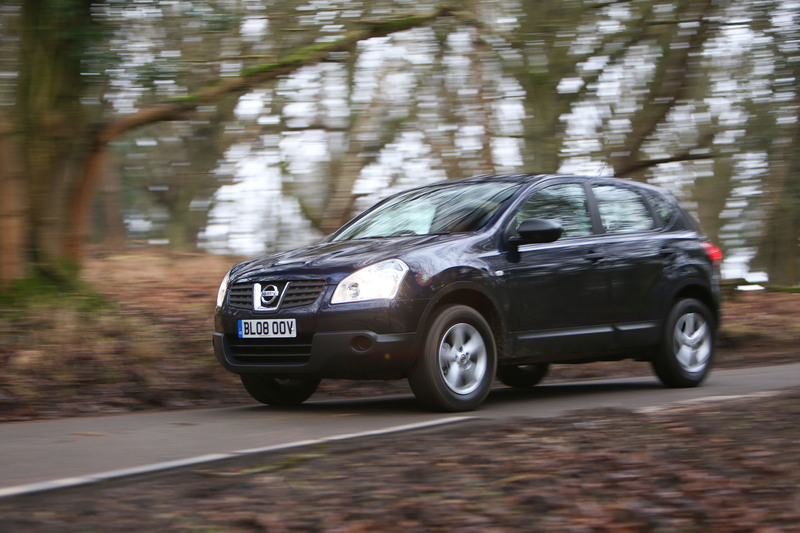 Of those, 1,752,232 were examples of the original model, including the seven-seat Qashqai +2. Not only has the UK produced most Qashqais, but much of the creative design and engineering work was carried out in the UK, too. Of the 200 people who worked on the original car, 80% of them were UK-based, although their task was somewhat eased by the use of an existing platform. By the time the second-generation Qashqai was under development, there were 500 people on the project at Cranfield and it has helped propel Nissan’s European R&D centres towards a 50% increase in staff. By the end of 2015, sales of SUVs reached a landmark in Europe, outselling superminis and small hatchbacks for the first time. Many models contributed to this, but there can be no doubt that the Qashqai lit the fire of growth. These days, this quietly accomplished crossover seems a bit ordinary. But count that as another measure of its success: the best ideas are the ones that take root so deeply that they become the norm. This significant but cannily less than exorbitant amount of money is about to become a crucial figure in the financial minefield of new car buying. Why? Because that’s the apparently arbitrary sum the government has decreed will mark the boundary between those paying a new £140 standard rate of Vehicle Excise Duty (VED, or road tax between friends) and those paying an additional supplement of £310 for years two to six of ownership. Years two to six? Indeed, because for the first year of ownership, the amount you’ll pay in VED will be linked to the CO2 emissions of your new car. However, the CO2 thresholds that determine what you pay have been dramatically revised compared to those of the present system. At the moment, no money at all is levied from those buying a car that emits less than 130g/km of CO2. From 1 April, the meaningful rate (£100) starts at just 76g/km and extends to £2000 for a car that breaches 255g/km – getting on for double the current M band for the heaviest polluters. Are you still with me? Good. For some new car buyers, this new system will radically change the amount they pay. Let’s take the new BMW 520d xDrive M Sport saloon for example: under the present system, you’d pay no tax on it in the first year and only £110 annually thereafter. 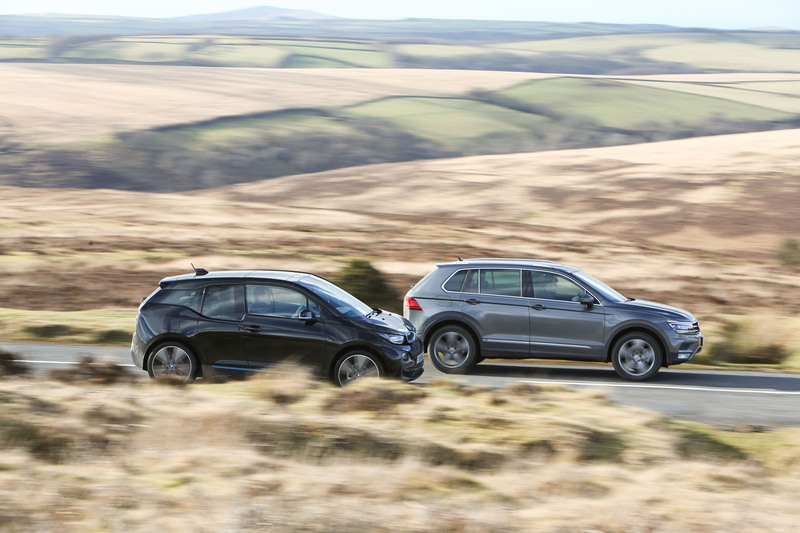 From 1 April, however, the BMW will command a first year VED payment of £160 then, for each of the ensuing five years, you’ll pay £450. That’s only £50 per year shy of the annual amount currently being coughed up by the owner of a McLaren 570S. Fair? That’s a sticky one. The powers that be would argue, not unjustifiably, that the current system, based squarely on CO2 emissions, has chiefly benefited those financially capable of buying increasingly efficient new cars while penalising those stuck in older models, which tend to emit more pollution and are therefore subjected to more tax. By introducing a supplementary rate based on purchasing power, it can claim to be taxing only those who can afford it. Naturally, the underlying reason for the change to VED rates is less about fairness and more about ensuring the Treasury’s revenue stream. Why has the threshold been set at £40k? Good question. The government hasn’t revealed the reasoning behind its headline number, but it’s probably no coincidence that the vast majority of models that make up the UK’s top 10 best-sellers slide comfortably under it. Nor does it seem entirely serendipitous that Porsche’s line-up starts at that price. Or at least it almost does. In fact, you can have an entry-level 295bhp Cayman with a manual gearbox for £39,878, but here we arrive at the rub: because the supplementary rate is charged on the list price with cost options attached, even the lightest smattering of chargeable ticks (for essentials like metallic paint and the locking rear diff with PASM) will have you forking out an additional £310 on top of your £140 standard rate in years two to six. In some cases, it is a spectacularly fine line. You can have a BMW 330d xDrive Luxury saloon, but you can’t have the Touring model. You can have a Land Rover Discovery Sport HSE 2.0-litre TD4 automatic, but only in Fuji white. You can have an Audi TTS with a manual ’box and everything as standard you’d really need, except the rear parking sensors required to stop you reversing into concrete bollards. Of course, that’s right now. Manufacturers’ prices fluctuate marginally all the time and, come April, it’s hardly inconceivable that some may think it in their interest to make some popular models sneak under the magic £40k threshold. Until then, there are two courses of action. One – and car companies are certainly anticipating this – is to buy this month and (in some cases) save yourself some significant money. Bought in March, the new Porsche 911 GTS will cost £650 in VED in the first year and £295 annually from then on. Register it in April and it’ll be £1200 followed by £450 for the ensuing half a decade. Your second course of action is to wait. If your fantasy driveway filler costs less than £40k already, you should consider this. The most grin-worthy example has to be the V8-powered Ford Mustang. Right now you’ll pay £1120 in the first year and £515 annually thereafter. As of 1 April, you’ll pay £2000 followed by £140 per year. The latter is the same a Toyota Prius owner will be paying. Granted, you’ll be stung for that £880 rise in the first year, but so significant is the annual saving that you’ll have recouped it in a little over two years of ownership – and, in that time, you get to cruise about in a proper, right-hand-drive, rear-driven, manually geared, unapologetically large muscle car. No, it doesn’t do 40mpg. Or even 30mpg. On the A303 for three hours, it managed 26mpg in our hands. But who’s to complain when the gallons gargle away so eloquently? 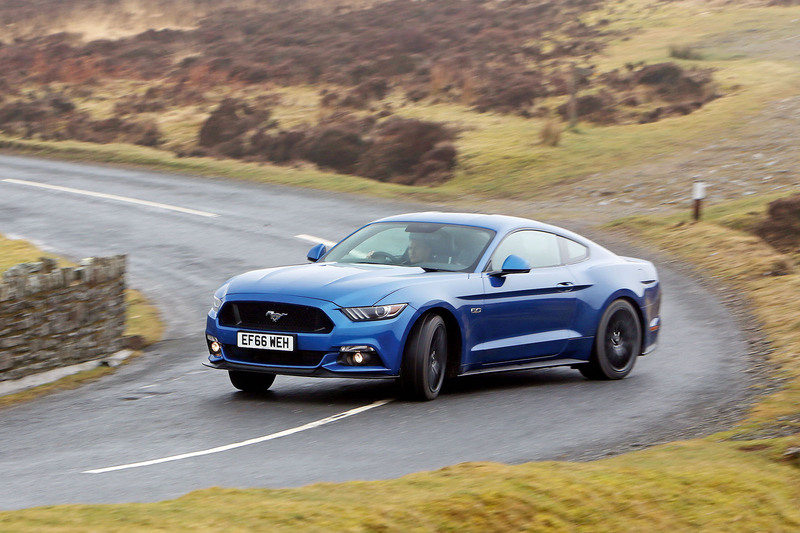 The West Country’s main artery might actually be the perfect UK road for the Mustang. The road’s weird, capricious meander periodically evokes the sweeping scale of the interstate. Drive a 410bhp European horizon-chaser along it and it’ll repeatedly strain against the 60mph leash. Ford’s funship, though, settles into an unworried groove, gently bubbling atop its suspension travel as it barrels forward. Pushing the pedals and pulling at the cue-ball gearlever is portentous work. The steering is as dull as a 9lb sledgehammer. The car doesn’t even seem fast. The 5.0-litre V8 works like the bellows of a great forge: inhaling and exhaling, sucking and squeezing and banging and blowing in bookchapter-long ratios. There’s no neck snap as you push on past caravans and Polish lorries, only a weightless sort of headiness as your barrel tumbles over the falls. Cast an eye downward at this point, though, to the green glow of your ‘ground speed’ and you’ll find yourself thundering incredulously toward a magistrate’s extreme displeasure. It’s a tongue-out great shaggy mongrel of a car, then; not for everyone and not precisely perfect, either. But it’s the quintessential antidote to driving torpor and, even with £2k worth of optional extras, costs just £37,925. Alternatively, you could funnel the money in the Continent’s direction and buy Germany’s idea of a fourseat hot rod. Handing nearly £40k to Audi is as unimaginative as betting on a fixed fight, but the returns are similarly guaranteed: where the Mustang feels fit inside for driving you to the shops two towns over, the S3 saloon has the sort of cabin you’d hope to be sealed in should you find yourself blasting off to Mars. Truth be told, we’ve brought the car to Exmoor as a stand-in for the new Volkswagen Golf R, the model with which it shares a powertain. 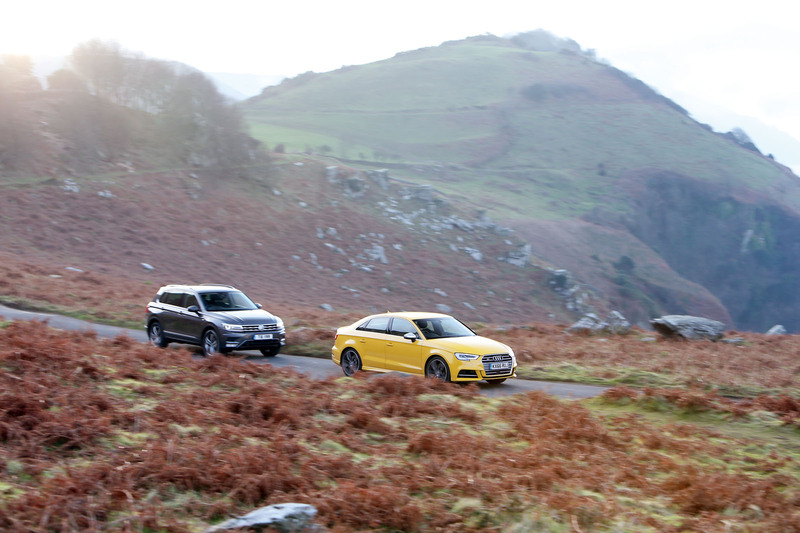 However, that doesn’t prevent Audi’s Q-car saloon from working its own peculiar charm. 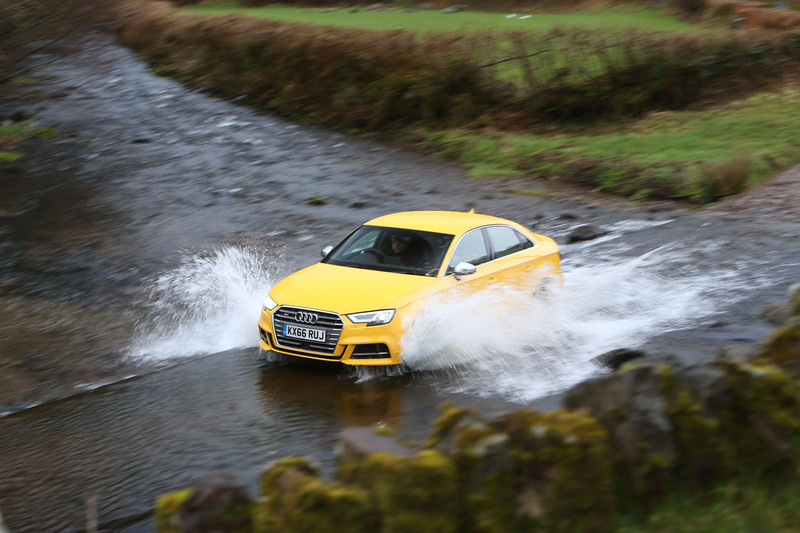 Naturally, with quattro-branded all-wheel drive and a 306bhp 2.0-litre engine, it’s fast. Fast in precisely the way the Ford isn’t. Irrevocably fast. It is like this because the turbocharged four-pot, although sounding disappointingly distant after a V8’s throb, is as immediate and as forthright as a Pete Sampras serve. It zings. And because it is wedded to the S tronic automatic ’box, it excels at propelling you mindlessly forward. On the B-roads spanning Exmoor proper, should you feel minded to try among the crests and dips and blind bends, the Mustang driver (saddled with winter rubber in the case of our test car) wouldn’t see where you went. I rather like the S3. As with the Ford, it feels like a lot of car for the £35,405 you’d pay for one equipped with the preferable manual gearbox. It’s a price that leaves plenty of wiggle room to add metallic paint and parking sensors and even the Virtual Cockpit infotainment system with three years of 4G internet access without troubling the £40k mark. Also, in contrast to the Mustang’s climate-warming 299g/km, the S3 we drove emits just 151g/km, making its first-year tax obligation a more bearable £500 – and you’d probably manage 35mpg from its 43.5mpg combined claim. If ecological reasoning or running cost efficiency are primary concerns, then there are plenty more sensible places to invest – and that, too, is a good thing because the new VED rules do tend to hit drivers who were previously rewarded for their parsimony. The BMW i3 – still our preferred electric city car option – is a perfect case in point. Buy it in its zero-emissions, battery-only format and the £4500 plug-in car grant will ensure that it’s still free across the board, attracting no showroom tax or subsequent annual charge. Opt for the Range Extender version pictured, which adds the 647cc two-cylinder petrol engine-generator, and its measly 12g/km CO2 emissions will mean parting with a £140 standard rate after £10 in the first year. 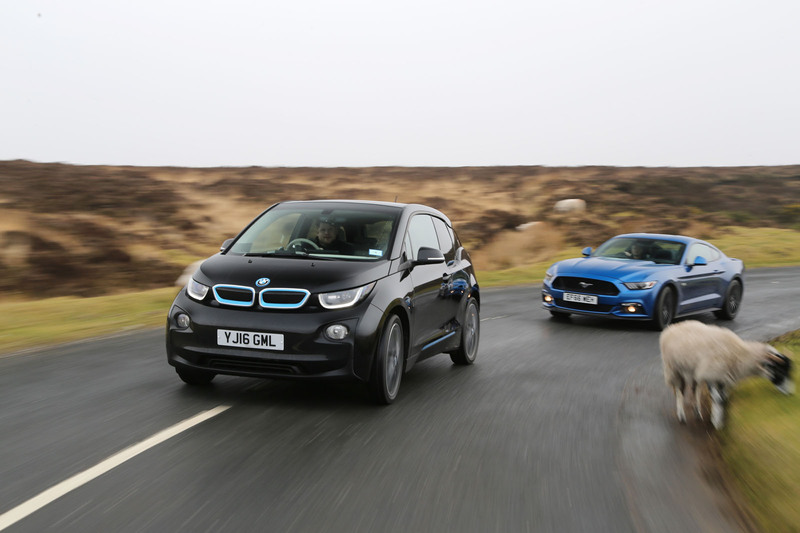 Given that the introduction last year of a denser 33kWh (or 94Ah as BMW prefers) battery increased the standard i3’s range to around 120 miles – and assuming you’re buying electric in the classic ‘second car, urban runaround’ mould – the electric-only i3’s diddly-squat tax liability only reinforces the idea that it’s probably the one to pick. The i3’s skinny, low-resistance tyres don’t particularly endear it to damp B-roads on Exmoor, but drop into the seaside town of Lynmouth and its supreme about-town usability, centred on its still eye-opening torque delivery and minuscule turning circle, is unmistakable. The real attraction, though, is the sophisticated and inspired packaging, a highbudget conglomerate of carbonfibre reinforced plastic and exposed hemp fibres that casts you as a member of the bourgeoisie in some near-future mega-city. What a shame, then, that the present hasn’t yet caught up to BMW’s conceptualising: even with its generator and 9.0-litre petrol tank to fall back on, the i3 still threatened to exhaust its range at inopportune moments during our time with it and it needed an additional hour to get back to London from the West Country because of broken motorway services charging points. If £40k seems like a lot to pay for a vague sense of anxiety, our final realworld VED-beater plugs all the holes. The steep upward sales trajectory of the mainstream family-sized crossover will likely be untroubled by the rate change because most contenders are well within the £40k threshold. We’ve picked the Volkswagen Tiguan here because (a) we’ve already awarded it four-and-a-half road test stars and (b) the SE L 4Motion model we drove back from Exmoor came equipped with the firm’s new 237bhp 2.0-litre twinturbodiesel engine. Much like BMW’s 3.0-litre straight six is to the X3, the gutsy four-pot is the barbecue sauce to the Tiguan’s established rack of ribs – and because you can’t currently have an X3 xDrive30d SE for less than £40k, it’s about as likeably burly as a £140-standard-rate diesel SUV gets. Predictably, the burliness remains under wraps while you’re in return leg A303 traffic, although you need only a whiff of space on the road to deeply appreciate the way 369lb ft is deployed. The go-faster charm is all the more noticeable because this is the kind of scenario in which the standard 2.0-litre TDI lump – even in its more powerful 187bhp guise – suddenly shows the strain, getting louder and harsher but not notably more productive. Consequently, rather than redefining the Tiguan’s appeal, the additional power slots seamlessly into the back of the driver’s mind as yet another ticked off facet, there for when it is needed. Opting for the new 2.0 engine now over the equivalent front-drive 148bhp variant would mean paying an additional £100 a year in tax, having already summoned up £300 extra at the showroom. Wait a month and it’ll be £340 more initially, then the same £140 a year for being happier, earlier, smarter, safer and better energised. And with Her Majesty’s Revenue and Customs to thank. John Surtees, the 1964 Formula 1 World Champion, has died aged 83. Surtees passed away at St George’s Hospital in London today after being admitted last month for an ongoing respiratory illness. His wife, Jane, and daughters, Leonora and Edwina, were by his side. Surtees remains the only person to win world championships on two and four wheels, winning seven motorcycle titles on 350cc and 500cc motorbikes between 1956 and 1960, before securing the F1 title four years later. His subsequent work in motorsport included establishing his own eponymous team, which competed in F1, Formula 2 and Formula 5000 through the 1970s. His son, Henry Surtees, was born in 1991 and eventually pursued a career through the junior ranks as a racing driver. However, he tragically died in 2009 during a Formula 2 race at Brands Hatch. In his memory his father established the Henry Surtees Foundation charity, which assists people with brain or physical injuries and can provide them with motorsport-related training. Most recently, John Surtees was made a Commander of the British Empire (CBE) in 2016 for his services to motorsport. Autocar offers its deepest condolences to family and friends of Surtees. If you’ve been following pre-season testing you’ll have heard pretty much every Formula 1 driver on the grid describe his new car as the fastest he’s driven yet. Well, maybe apart from Fernando Alonso. With significantly more downforce and extra mechanical grip, the drivers of 2017 have to contend with much higher g-forces and heavier braking loads than last year. Pushing an F1 car to its limit has become a drastically more physical experience than it was and most agree that’s a good thing for the top rung of motorsport. But it’s still some way off what drivers had to contend with in the early 1990s. Martin Brundle is now better known for his role as a Sky F1 commentator, but he spent the best part of 10 years racing in what will likely remain F1’s most physically demanding era. In his career, Brundle drove for seven teams including Tyrrell, Benetton and McLaren. He raced the monstrous turbo cars of the mid-1980s, which had outputs of more than 1000bhp and needed butch drivers with wrists of steel or moustaches to operate them. Yet it’s actually the higher downforce cars of the following decade that Brundle remembers as being the toughest to drive. You only have to watch the onboard video of Brundle from 1992 (above), when he was teammate to Michael Schumacher, to see what he’s talking about. Brundle can be seen wrestling with the wheel, battling violent kickback and turning against steering loads of several dozen kilograms – something he did lap after lap. Not only did you need big cojones back then, you needed phenomenal muscle endurance. Compare that to today, where drivers steer with fingertip accuracy, and it looks as though the cars of the early 1990s will forever remain the most exhausting to drive. But that’s not to say this year’s cars are easy to master. Pre-season testing in Barcelona has shown that lateral loads have nearly doubled in certain corners compared to last year, with the circuit’s third turn a perfect demonstrator of the higher g-forces – watch new Mercedes signing Valtteri Bottas take it flat out below. Lap records will be broken this year, which is something that F1 hasn’t been able to do on older circuits since 2004, when the monstrous V10 era ended. Brundle expects both race and qualifying pace to be as fast as ever, with the new, wider Pirelli tyres playing a big part in this transformation. This will enable drivers to push harder for longer, further adding to the physical challenge. However, Brundle hopes it doesn’t translate into the procession races F1 had to endure when the grooved Bridgestone and Michelin tyres of the mid-2000s proved too durable. “My concern is they’ll go back to one stop races or they’ll pit on the last few laps to put the slower tyres on,” he comments. The truth is, we won’t know exactly what this year’s regulation changes have had on Formula 1 until the first few races have taken place. In recent years, many have loved seeing drivers fight cars through the middle of corners but others, like me, missed the awe inspiring and unbelievable pace of higher-downforce cars. It seems this new-look F1 is back to that. Whether that makes for a better spectacle is yet to be seen. But at least we can rest assured that the 2017 cars are a heck of a lot harder to drive flat out, even if they might not be the hardest ever. You can catch Martin Brundle on the Sky F1 channel, which will be showing live coverage of every 2017 Grand Prix. In a universe of infinite possibilities, there must be a reality in which Audi’s 2009 marketing wheeze of retrofitting the A5 coupé with rear doors and a hatchback boot (and charging significantly more for it than the mechanically identical A4) was met with buyer contempt.Here, though, and despite the aftershock of recession, the frameless doors and more shapely body were a moderate hit, and the car was easily successful enough for Audi to deliver much the same overhaul that has already been visited on the A4 and the A5 coupé.The look has changed, but not substantially. The Sportback’s core theme is its retention of an eye-pleasing profile, meaning there’s nowhere for that distinctive rear roofline to go but quickly down to meet up with the jaunty back end.At the front, the Sportback receives much the same single-frame grille revision and wraparound bonnet front as previewed on the coupé and has been exhibited on the cabriolet as well.Equally important (perhaps more so if you’re underwhelmed by the exterior) is the cabin revamp, which upgrades the fixtures and fittings and swells the interior gently in size.The latter is thanks to the Sportback adopting the same MLB Evo architecture used for the A4. The engines are carried over, too, although not all of them; to maintain its more exclusive status, the A5 can’t be bought with Audi’s smaller petrol units or even its omnipresent 148bhp 2.0 TDI.Instead, the three TDI and one TFSI options are made up of headier choices, even if the trim levels – SE, Sport and S Line – remain.The focus on a higher tempo urged us to look at the 249bhp 2.0 TFSI, Audi’s idea of a spiritual successor to the bigger six-cylinder petrol engine now only offered with the S5.The 2.0-litre four-pot comes with quattro as standard (most Sportbacks will be front-wheel drive) and a seven-speed S tronic dual-clutch automatic gearbox, so it ought to be the version best suited to convincing us that Audi’s five-door coupé can deliver performance to complement its style. This is the very first UK drive of the all-new, all-powerful BMW 7 Series M760Li xDrive, but it didn’t start out that way. You see, we’ve driven this car as it should be driven, and as one would assume many prospective buyers might: a full international tour from Megève in the French Alps over 700 miles back to Blighty. 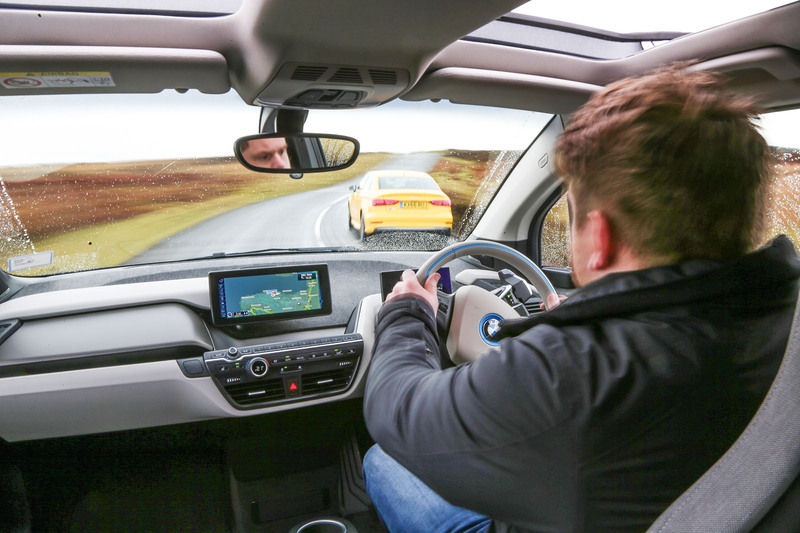 It’s a tough job, but when you’re as dedicated as we are at Autocar, sometimes you simply have to put in the hours behind the wheel.We’ll let you know what it’s like to drive in a moment, but first let’s touch upon the M760Li’s modus operandi. As you may be aware, it’s no M7, but it is the closest we’ll get to one; think of it as a 7 Series with a patina of ‘M-ness’ daubed over it, rather than woven intrinsically into its DNA. The previous range-topping 7 Series was the 750i, but for some, eight cylinders simply doesn’t cut it. So, the M760Li borrows the 6.6-litre twin-turbo V12 of the Rolls-Royce Wraith, and which may yet end up in the next Phantom. It’s been detuned for this car, but still, 601bhp wouldn’t look out of place in a supercar. And I’ve just checked: the 590lb ft of torque all but matches a John Deere 6175R tractor, although the BMW V12’s twist peaks earlier, at just 1500rpm.This car has everything thrown at it, so you get four-wheel steering, active anti-roll bars, an active exhaust, air springs tuned by M Division and an xDrive four-wheel drive system set up to push more power rewards than regular xDrive 7 Series models. Oh, and huge M Sport brake discs front and rear, gripped by distinctive blue callipers. The Kia Rio is now one of the biggest-selling global models of the world’s third-largest car-making group.Last year, at the tail end of its life cycle, the outgoing version of the Rio registered sales of just under 450,000 units.However, the car has a much greater profile elsewhere in the world than it has here in Europe, where, despite consistent sales growth, it has yet to break into the top 10 best-selling cars in the supermini class.You don’t come by a top-10 place in the European supermini sales charts easily, of course.In order to earn one, the Rio needs to displace a more established European-built small cars, such as the Seat Ibiza, Citroën C3, Fiat Punto or Skoda Fabia (it already sells better than the Mazda 2, Honda Jazz and Nissan Micra).With that in mind, slowly but surely over the past couple of revisions and not at all by coincidence, the Rio has begun to feel more and more like a small car tailored to European tastes – and this latest version develops that trend.Now in its fourth model generation, this new Rio is marginally longer and more squat than the outgoing one, and was designed by a team at Kia’s design centre in Germany charged with the idea of making it look more cleanly and sharply cut, and more smoothly surfaced, than it used to.Under the bonnet, the car gets a new, very Europe-focused downsized 1.0-litre turbocharged three-pot petrol engine.The unit promises to bring the Rio bang up to date and in line with the likes of the Fabia, Ford Fiesta and Renault Clio on driveability, economy and emissions.Inside the cabin there’s a new ergonomic approach to the fascia design and a focus on new connectivity features.And, perhaps most interesting of all, there’s even a new focus on dynamic sophistication for the Rio. Kia has trumpeted the efforts of its chassis engineers in introducing more agile handling, crisper steering, greater driver appeal and a more compliant ride.We ran the road test ruler over the car, fitted with its new 99bhp 1.0-litre T-GDi turbo triple engine, to find out if that top-10 sales rank beckons.